The year 2012 set major records. A quick Google search reveals it was the hottest year in US history and second wettest one in the UK. Data from 2011 and 2010 show similar extremes. But not only is climate change getting worse, it is also getting costlier. A report by United Nations International Strategy for Disaster Reduction (UNISDR) reveals 2012 is the third consecutive year to suffer economic losses of over $100 billion due to extreme weather events. Sixty three per cent of losses were in the Americas, mainly due to Hurricane Sandy ($50 billion) and the drought ($20 billion). Developed nations tend to accrue large economic losses in the face of a natural disaster as they have more assets and infrastructure. 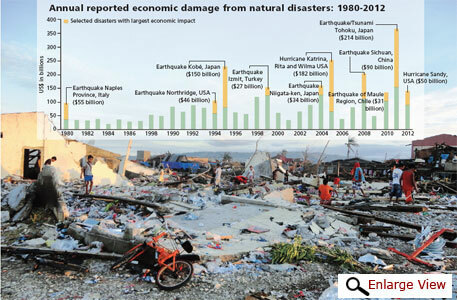 Most developing countries, however, rank far higher in terms of number of disasters that hit each year, number of deaths and percentage of population affected but do not show large financial losses owing to negligible number of insured assets. Asia was the worst affected in terms of casualties due to natural disasters 65 per cent of those killed in 2012 were Asians. About 20 typhoons and storms hit the Philippines each year and cost 5 per cent of its GDP. Typhoon Bopha that killed 2,000 people in the archipelago ranks the highest for 2012 in terms of deaths due to a natural disaster, followed by floods in Pakistan and Nigeria. “Most victims this year were of floods and droughts, which were responsible for nearly 80 per cent of all deaths. But as they occurred in poorer countries, the economic losses are low,” says Debby Guha-Sapir, a professor at University of Louvain in Belgium. It is well-known that economic as well as environmental impacts of climate change will not be felt evenly those who pollute the most might not suffer the most. This raises the question of liability and compensation. How it began Is India serious enough? • A CoP in 2010 called for a separate group to address loss and damage and recognised the concept of “slow-onset” damages, like sea level rise, glacial melt, salinisation and biodiversity loss The Climate Change Vulnerability Index for 2011, compiled by UK-based Maple croft, shows India is second most vulnerable after Bangla desh in a list of nations at “extreme risk” from climate impacts. Other reports suggest India is as vulnerable as some Least Developed Countries (LDC). However, there is an emer ging consensus within civil society that this does not reflect in India’s approach at UNFCCC negotiations. Since the inception of the loss and damage work programme in 2010, Indian government has made just one submission on the issue. That too primarily addressed India’s adaptation needs, mentioning loss and damage just once. While most emerging economies that rank highly on vulnerability indices, like China, the Philippi - nes, Ecuador and Thailand, along with Alliance of Small Island States and LDCs made submissions prior to the CoP at Doha to address the role of the Convention in dealing with loss and damage, India did not make any contribution. As the debate gains complexity at a quick pace, not engaging with it in early stages could cost the country dearly in the long run. At the most recent annual climate change meet in Doha (CoP-19), under the United Nations Framework Convention on Climate Change (UNFCCC), countries fought a bitter battle to answer just this. Many understand loss and damage as going beyond adaptation: addressing those impacts of climate change that cannot be avoided. But the line between adaptation and loss and damage remains a fuzzy one. Most elements currently being discussed under the loss and damage work programme include conventional ways to address weather-related disasters such as risk reduction and management. But these are actually ways to anticipate and reduce the impacts of a climatic disaster and fall under adaptation realm. They also do not address slow onset events, like sea level rise and glacial melt. Establishing a clear boundary between adaptation and loss and damage is, thus, the key to defining the scope and scale for a compensation mechanism. Alliance of Small Island States (AOSIS), a grouping of 43 states, has long demanded such a mechanism. But the term “loss and damage”, has always frightened historically high-emitting developed nations—it could bring liabilities of potentially unlimited economic value. Many elements—like definition, attribution, approach and beneficiaries under this complex issue also remain unclear. Attribution or identifying the proportion of loss and damage due to human-induced climate change as opposed to other factors like climate variability, poor governance or poverty is also technically challenging on many levels and fraught with uncertainties. This has been the largest contention, particularly for the US. Allen Myles, who heads the Climate Dynamics Group at University of Oxford, says for any compensation settlement one would need to differentiate between what fraction of a loss was due to human influence on climate and what fraction might have happened anyway. Some, like the European Union, point to the expertise that already exists outside UNFCCC in the area of disaster management and question the level of engagement the Convention should have on the subject. But most developing country parties want any mechanism on loss and damage to be anchored in UNFCCC. They argue that the Convention has several clauses that clearly direct developed countries to take a lead in mitigating emissions and providing financial and technical support to the most vulnerable countries. Experts, however, believe that even if a consensus is reached on loss and damage, there’s a pressing need for developed nations to mitigate emissions and check further environmental damage. Atiq Rahman, executive director of Bangladesh Centre for Advanced Studies, believes the reason developing countries are pushing for loss and damage is because developed nations have not met financial commitments on adaptation and are not adhering to emission reduction goals.